Pizhichil is a special kind of Ayurvedic massage treatment method, which is highly beneficial to the full body and cures many body problems. 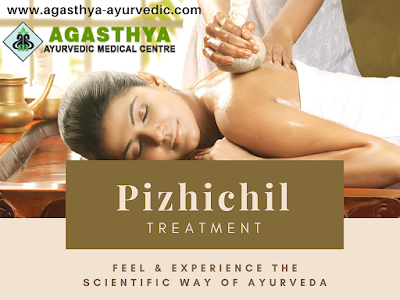 Pizhichil Ayurvedic massage treatment is also known as Sarvanga Sneha, Kaya Seka, and Taila Seka. Agasthya Ayurvedic Medical centre, Alleppey is one of the best centers that provide marvelous treatment facilities for Pizhichil Ayurvedic massage. What is the meaning of Pizhichil? The meaning of Pizhichil is to squeeze. Pizhichil is the form of sarvangdhara, in which sarvanga means the full body and dhara means stream. So, the meaning of sarvangdhara is to pour a stream of oil on the full body. In this type of massage, a cloth deeply dipped in the lukewarm Ayurvedic oil is used to provide massage. What is the procedure of Pizhichil Ayurvedic massage? The procedure of Pizhichil Ayurvedic massage includes a simultaneous massage of herbal oils over the full body for a certain period of time under the supervision of trained Ayurvedic doctors. The whole one massage takes 60 minutes to complete and whole treatment takes around 7-21 days according to the requirements. The type of herbal oil depends on the personal medical conditions and preferences. The massage is given in a synchronized and rhythmic motion that stimulates body functions and cures body problems. What are the benefits of Pizhichil Ayurvedic massage? Ayurveda has provided treatment for all types of pain, ailments, diseases, and disorders. However, it is recommended to use Ayurvedic treatments under the supervision of authentic Ayurvedic doctor. Agasthya Ayurvedic Medical centre, Alleppey has authentic and experienced Ayurvedic doctors for Pizhichil Ayurvedic massage treatment and for other Ayurvedic treatments. The medical center has its own divine environment to keep a person fresh and rejuvenate.